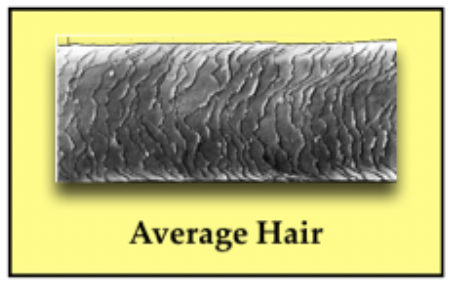 The Role of Hair-Texture in Haircoloring and in today's haircolor lesson I want to talk about The Role of Porosity in Haircoloring. Texture and Porosity are the two main variables that determine the outcome of color treated hair. That is why I have chosen to discuss them at length. The better understanding you have about how these two variables work together during the haircoloring process the better colorist you will become. 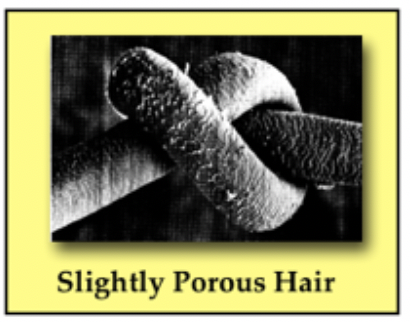 Definition of Porosity: Porosity, for our purposes is the hair's ability to retain and absorb moisture. This moisture could be water, hair products and chemicals such as Haircolor and Permanent Wave solutions. All of these moisture producing products must penetrate in the Cuticle Layer and go into the Cortex Layer of the hair to do it's job. Porosity is often referred to as the "condition" of the hair, since hair that is excessively porous will feel like dry hair to the touch. Each one of these Stages represents how much the cuticle layer has been lifted up (Swollen) from the hair strand. The higher the cuticle is lifted the more porous the hair will become causing potential damage to the cortex. When the hair is excessively porous, the cuticle layer is either damaged, lifted up too much or completely missing leaving the hair vulnerable to drying out, constant split ends and prone to breakage. Typically, it will be free of any chemicals and has not been exposed to either excessive heat damage from hot styling tools of from environmental exposure such as the sun. 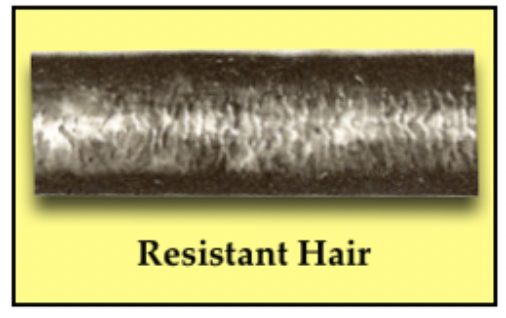 Resistant hair will have a tightly compacted cuticle layer. Water doesn't penetrate the hair shaft easily and it may require a longer processing time when haircolor color is applied. On more extreme resistant situations "Pre-Softening" of the hair will be required in order to get adequate gray coverage on the hair. Slightly Porous hair will have a Slightly raised cuticle. It also may have had mild chemicals used such as Demi-color and limited use of hot styling tools. This type of hair may also have had some sun exposure or chlorine water but not so much as to damage the hair in any way. Although this type of hair may still require a slightly longer processing time or the use of "Per-Softening" when haircolor is applied. 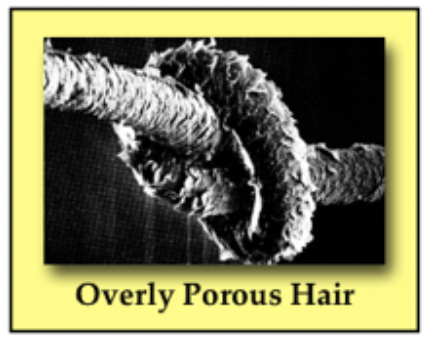 Hair with Normal Porosity (Average Hair) will be the easiest of all to work with. It will allow the gray hair to be covered easily and lend itself to most haircoloring and bleaching services without compromising the integrity of the hair. It will usually have a moderately raised cuticle and a normal amount of elasticity. Haircolor will process in an average amount of time and lighteners will lighten the hair easily with 20 Volume developer. 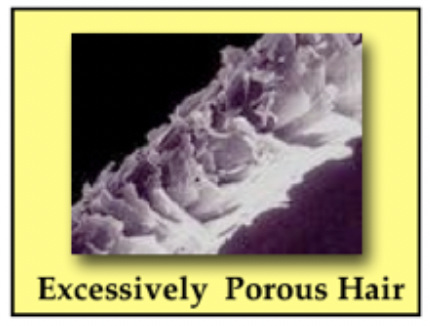 Overly Porous hair has been damaged due to Over exposure to high alkaline chemicals such as Bleaches or high lifting haircolor products, excessive amount of exposure to sun, wind and salt water. And/or constant use of high heat implements. Typically, due to the swollen cuticle the hair will have a dull or frizzy look to it. This type of hair will absorb color quickly but it will also fade quickly making it very tricky to color or bleach. Excessively Porous hair is also known as damaged hair and will be impossible to color. Remember that Good Haircolor can only exist in Good Conditioned hair. It's virtually impossible to get any type of haircolor to hold in hair that has this degree of porosity. This type of hair has been exposed to High alkaline products, high heated styling tools or excessive sun or environmental damage. It will Feel extremely fragile, have poor Elasticity and is very prone to Breakage. This is a very important haircolor rule for you to understand because most haircolor manufactures make haircolor by using "Blended Bases". That is to say that even in a warm base color, such as "Gold" the product could still have an ashen color in it as well. This is why you sometimes will see Blondes with a Green Cast or Redheads with a Dark Muddy look on the ends. So there you have it, How the roles of Texture and Porosity relate to the haircoloring process. Once these two variables have been mastered 98% of all your haircolor problems will be solved. If you would like more information on How Haircolor Really Works, check out my book by that same name by Clicking Here. You need to be a member of Haircolor Clubhouse to add comments!